When setting up a new blog, it's really important to have a clear strategy on how you will build an engaging community. Many people say that 'content is key', but in my opinion, 'Community is key'. Having said this, to build a community you need good content! I've been working with several blog owners to help them drive traffic to their blogs, as well as running a few blogs of my own (Find My Blog Way included! ), so I have a fair understanding of what it takes to build a solid community. With this in mind, I'm going to share with you some of the basic strategies that I have used to help grow online communities and drive quality visitors to my sites. My first port of call when looking to build any kind of community is to take a look at some existing communities that are within my niche. Tapping into existing communities and becoming an active member can help you understand what your target users respond well to and give you a platform to promote your own website. With most community driven websites it is clear who the key influencers are. Taking inbound.org as an example, they have a 'influential members' list that shows the top five members at any given time (based on how many upvotes, etc the have). This can be a perfect starting point for outreach - share some of their content and get in touch with them to let them know that you have done so; chances are that they will share your content in the future. My article that I recently wrote on advanced conversion tracking managed to get 220 unique visits in a day just from inbound.org alone. That was simply from having my article shared by another inbound member. Another great way to build your authority in communities is to become a moderator. A great platform for this is Google+ communities. 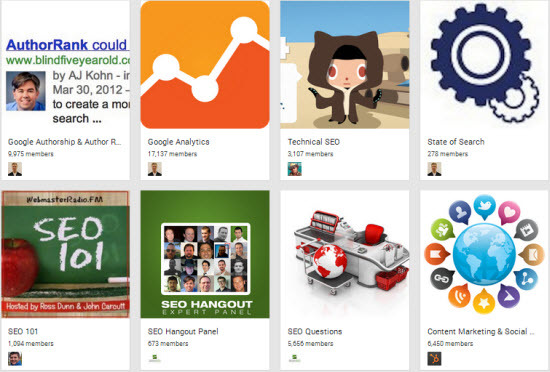 I am an active member of many different Google+ communities, including my own 'Online Marketeers' group. As a community manager, I'm always looking for members that will engage and interact within the group regularly. If I find that someone is going above and beyond then I often ask them to become a moderator, giving them a much greater standing within the community. I was a moderator of around 10 different communities at one point (until I realised that I was spreading myself too thin!). This resulted in huge levels of traffic coming through to my website as I found that a lot of people were more inclined to share my content when I was in this position. Have a little search on Google+, start engaging and just ask the creator of the community if you could be a moderator - in return, you can offer to moderate any spam, post great content and promote the community across your social media accounts (it's a win-win). Tip: if you join a community as a moderator through your G+ business page, all of the +1s that the community has will also be transferred over to your business page (and also showing as +1s to your homepage if your domain is verified!). This is a great way of getting your blog noticed and also building some links to your site in the process. I talked about this quite a while ago and started running a weekly round-up of the best SEO-related articles every week on the Wow Internet blog. As a result, we get contacted at least five/six times a month from the people that we have mentioned - this often leads on to collaboration opportunities, social shares and comments on our posts (all of which as key elements for building a community). Ensure you have social media share buttons on each of your posts. Have 'social media friendly' comments set up (e.g. Disqus/FB Comments/etc). Set up authorship on your posts. Add an RSS feed subscribe button to your header/footer. Enable users to subscribe to your newsletter to get more updates (here's an awesome WordPress plugin for that - http://ninjapopups.net/). Add twitter card meta data and FB open graph markup. Ensure you have Schema.org markup across your posts. Once you've ticked off the list above, it's time to start thinking about the off-page social media activities. Make sure that you are sharing your content across all of your blog's social media profiles as soon as you go live with new content. A quick way that you can do this is by using services such as Twitterfeed or Dlvr.it (this automates the sharing across your accounts without you having to do anything). I read an awesome post today from Jeff Sauer where he talked about the impact that self-promotion through social media and outreach had on his blog's traffic - the results say it all. Every major piece of content that I put together gets sent out to a few different people that I engage with regularly or have good personal relationships with. As a result, I will often get a tweet/like/+1 at minimum; at best I get a link and a ton of referral traffic. this is another strategy that I regularly employ to build my blog's following and encourage more social shares for my content. Simply reaching out to a few influential bloggers within your niche and getting their input on an article that you're putting together can be an awesome way to get some attention. For the readers it offers a variety of expert opinions, and for the contributors it throws out some nice ego-bait that will often result in them sharing the post and engaging in the comments. The above snippet is of a blog post that I published within the first few weeks of launching Find My Blog Way. As you can see, the post had loads of social shares (FB:32, G+:107, LinkedIn:15, Twitter:117) and it also had 8 comments. I actually wrote a grand total of 150 words within that post and spent around half an hour doing outreach - not bad considering it had 1,254 unique pageviews. Don't give away something that is too high value; stick to around £40-100 ($60-150). Be prepared to spend double the value of your give-away item(s) on promoting the competition. Only give away items that are relevant to your readers. Use a competition platform like Punchtab or Rafflecopter. Give users multiple entry options and order in terms of priority (i.e. Like the FB page, sign up to the newsletter, comment on the blog post, tweet about us, follow us on Twitter, pin our image on Pinterest, etc). Reach out to lots of niche-relevant bloggers and incentivise them to blog about your competition or share it via social media. This can be through giving them extra entries into the competition, offering them ad space on your blog, paying them a one-off fee, offering to pay their web hosting for a month, giving some extra give-away items exclusively for their readers, etc (you get the idea, so get creative on this front!). Make the competition page as shareable as possible. Think about making a video or short animation that will encourage people to share (if you can't do it yourself then go browse Fiverr.com and I'm sure you'll find someone who can). Submit your site to a load of competition/offer websites to get more traffic through to your competition page (this really does work well). Post about the competition across your social media accounts and run some paid Facebook ads for extra exposure. Consider running a paid discovery campaign on StumbleUpon - this can be really cost effective and usually results in quite a new few entries. Get in touch with the manufacturer of the goods that you're giving away and ask them to share the post on Twitter/FB. Send out the competition to your newsletter subscriber list and have a follow up email on the day before the competition ends. Make sure that you don't run the competition for too long - stick to between 10 and 20 days maximum. If you have a more established blog that has a really engaging community then you can look at running one day 'flash offers'. Here's an example of a pretty successful competition that I ran for one of my clients earlier this year - http://www.jimmysworldgrill.co.uk/eat-free-for-a-year. The competition gained over 10,100 entries in total, which was awesome! After all the hard work that you have went through to build your email subscription list, the last thing that you want to do is to start having people unsubscribe. Make sure that you're only sending valuable content through to them - don't just send an email to everyone to say you have posted a new article (unless you write once a month/couple of months) because people will get fed up of your emails. Try to get creative and have themed emails sent out each week that don't just self promote. The Moz top 10 list is an awesome example of this that showcases the top ten articles of the month from across the blogosphere. This is one of the few email subscriptions that I really look forward to reading and it ensures that I always open my mail from them. Engage regularly within other communities and you will generate good levels of referral traffic. Get influential bloggers to contribute to collaborative content on your blog. Ensure your blog is set up in a way that encourages social sharing. Excellent post Matt – these are some great ideas and many I haven’t thought of using in the past. Thanks Jeff, really appreciate that. I’ve found that with this blog in particular, being active within other communities has been a huge traffic contributor. Great Post indeed on building online community and many of these points will definitely take time to implement and master. but, Like Darren said, successful blogs didn’t start out successful, it takes everyday small actions to make a success. Thanks Barby, I will start implementing everyday with this list, and hopefully come back to give my testimony. Thanks for sharing your ideas about builing online community,it helped in gainning knowledge about blog and its success,surely will try to implement these ideas.